Alana Bruce ~ can stand and seems to be catching up to age markers. Continue to pray for healing. Sue Bruce ~ since Thanksgiving, she has been having more and more trouble with her MS. Jan. 4, she began having vision loss in her left eye, multiple physicians see nothing wrong internally. Next step, Neuroopthomologist at Vanderbilt. God is in control. Pray for her to graciously accept His Will. Donnelly Family ~ as Tom's mother passed away on Jan 22. Remember them in prayer during this difficult time. ODell Family ~ Leona fell week and had to have surgery to repair a broken hip/leg. Pray for her recovery. Stephen Springer's granddaughter Maya ~ was born preemie and has overcome many hurdles. Please pray as she grows. Prison Ministry ~ please find addresses on the Bulletin Board for fellow members in prison and encourage them by sending cards. We are looking for committed men and women with a passion for souls to be trained and mentored to minister to the forgotten ones who are in our local jails. Call John for info 423-316-6722. Many Thanks ~ from the Donnelly and Burgess families to all who have shown care and concern during the recent weeks and months of our Father's illness and passing. Your love and kindness is deeply appreciated. Brailsford Baby Birth Announcement ~ Whitney Brailsford and family would like to announce the birth of her baby boy Josiah Maurice Moten. Josiah Maurice made his debut on January 4th at 1:33 am, weighing 7lbs 12 oz. The Brailsford family would also like to share their much appreciated gratitude and thanks to all who gave baby gifts, extended heartfelt prayers and well wishes during this special time. 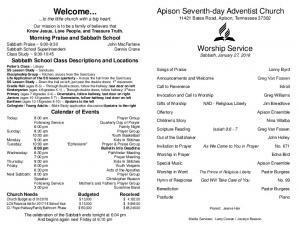 Apison Ensemble ~ will be playing today during the worship service. Interested in joining, please email / call [email protected] or 256-457-6464. 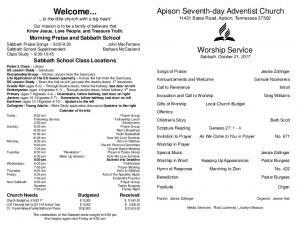 Quarterly Day of Prayer for the Apison Community ~ is today, Jan 27 1-4:30 pm. We will begin with a light lunch in the fellowship room following the worship service. Bring fruit/sandwiches for a quick meal together. Please NO sugar for our meal for clear minds. Family Fun Night ~ tonight, Jan 27, 6 pm in the gym. Come on out and have some fun! Apison Hour of Prayer (AHOPe) ~ join us as we seek the Holy Spirit for our lives, our church, the world church and government leaders. Sabbath mornings in the Church Library at 8 am. On Sunday mornings, 8:30 am, join us by calling 712-775-7031 and use access code 682-097-212#. Sunshine Band ~ meets the Sabbath of each month at 3 pm. See John MacFarlane for more information. Youth and Young Adult Super Bowl Party ~ Super Bowl Sunday, Feb 4. Contact Pastor Franky for details. Elder's Meeting ~ on Thursday, Feb 8th at 6:30 pm. Betty Varner Death Announcement ~ grandmother of Kristina Mullis and mother of Elaine Raines passed away Sunday, Jan 21st at Country Haven Retirement Center, Ringgold where she resided for the last 6 years. Visitation and a memorial service were held this past Tuesday, Jan 23rd at the Ringgold SDA Church with Mike Pettingill officiating. She was laid to rest at the Chattanooga National Cemetery with her late husband Otto Varner. Keep the family in prayer. Quarterly Ladies Breakfast Fellowship ~ Sunday Feb 11 sponsored by Women's Ministries. All ladies and teen girls welcome. Watch for details. Contact Janice 931 787-8108. Revival ~ beginning nightly Feb 22nd @ 6:30 pm thru March 3. Are you in a spiritual rut? Join us for WALKING WITH JESUS…A PERSONAL REVIVAL to reignite your relationship with Jesus. Childcare for 10 year and below will be provided. Please continue to pray for our church and nonattending members during our 90 days of Prayer as we prepare for the Revival. If you missed the Prayer card to insert in your Bible as you pray daily you may pick one up at the welcome desk. Read Steps to Christ before the series begins on Feb 22. 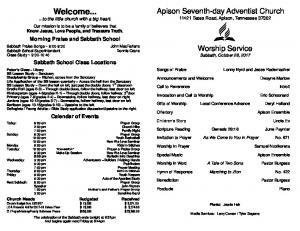 Church Directory ~ We are happy to have the new Church Directory available. Want a hard copy? Place $10 in a tithe envelope, mark it Directory, include your name and phone number. Special thanks to Noelle Holland for her hard work. Area Announcements ~ see the bulletin board in the hall weekly. 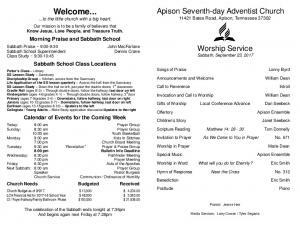 Area Announcements Sunshine Bands ~ of music, ministry and friendship are welcome at The Lantern of Collegedale 2nd and 4th Sabbaths, 3 pm. Evening Anthem Vespers ~ is featuring Joshua Knight on organ and piano in a program entitled "Keyboard Praise." Come and be blessed as Mr. Knight uplifts God through his thoughtful and inspiring presentations at Chattanooga First Church this evening, Jan 27 at 5 pm. For those not familiar with Mr. Knight, he is the Minister of Music at Chattanooga First, organist at United Methodist Church in Cleveland and a student of Judy Glass at SAU. Evensong with I Cantori ~ this evening, Jan 27 at 6 pm, in the Collegedale Church. They will present songs that celebrate the unique joys of Sabbath. SAU Symphony Orchestra ~ presents its annual Concerto Concert at the Collegedale Church tomorrow, Jan 28th, 4 pm. The program features eight young artists playing the music of Rachmaninoff, Prokofiev, Mozart, Guilmant, Weber, Milhaud and Dvorak. Come and enjoy the brilliance and artistry of these young performers. It Is Written ~ is searching for a Customer Service Supervisor! If you have a passion for ministry, strong leadership skills, and a background in customer service, this position may be for you. If interested please visit iiw.us/nowhiring before January 31st! SonRise Auditions ~ for the main cast of SonRise, Collegedale Church’s walk-through resurrection pageant, will be held Jan 29 - Feb 1, 6 to 9 pm. Auditions are open to all and parts include Jesus (6), Mary Magdalene (6), John (6), Salome (6), Peter (6), Mary Mother of Jesus (2), Satan at Gethsemane (1), Gabriel at Gethsemane (1), Pilate (1), Thieves on the Cross (2), Resurrection Satan (1), Gabriel at Resurrection (1) and a vocalist at Crucifixion. Find cast application and audition info under the Audition tab, comeseejesus.com. Email [email protected] to schedule an audition or to be cast in a non-auditioned part. No internet access, call (541) 519-3383 for audition info. GCC Band & Strings Music Festival ~ GCA will host the annual conference-wide Elementary Band & Strings Music Festival on Feb 1-2. Student participants will have the opportunity to work with professional clinicians as well as interact with other student musicians during the two-day event. The event will culminate in a festival concert during Friday night vespers. Participation & accommodation is free of charge except meal costs. If you know an elementary school student who plays a band or string instrument and is interested in attending, please have them visit gcasda.org and click the GCC Band & Strings Festival button to register. MARK TWAIN ON THE SOUTHERN BELLE ~ on Sunday, February 25, 2 to 5 pm. For tickets, contact Becky Daugherty (423) 580 1541 or Chattanoogariverboat.com. Area Announcements Cont’d GCC Prayer Conference ~ is Feb 16-18 at Cohutta Springs Conference Center. Does your spiritual battery need recharging? Are you ready for some new ideas on making your time with God more meaningful? This conference is for you; plan now to attend, "If My People Pray." To register, go to www.GCCSDA.com. Last day to register is Feb 6th, 1 pm. Questions, call Virginia 423-478-3911. Collegedale Little League and Summer Softball ~ is swinging into action for a great 2018 season! Registration is open at cdalesoftball.com. New for 2018 – The older girls division is now two divisions: JV Girls (grades 6-8) and Senior Girls (grades 9-12). We are seeking coaches who are interested and willing to work with the youth in our community. The first coaches meeting is set for Sunday, Feb 18, 5 pm in Room 3145 at Hulsey Wellness Center. If you would like to coach or have questions, call Renita Moore 423-304-5754. Academy Day at CA ~ Friday, February 23, 9:45am – 2pm. CA invites all high school aged students to come see what it’s like to be a part of the CA family. This includes rising freshmen and all high school grade levels that will be new to CA. Academy day kicks off enrollment for 2018-19. 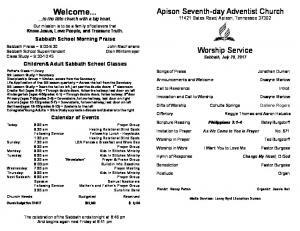 To register for Academy Day or for more info, 423.396.2124 or [email protected] The Samaritan Center ~ needs grocery bags! Our stores use 800 - 1000 plastic bags every day and are always running low. Exec Dir, Tony Dahlberg invites you to "make a habit of giving your baggage to the Lord and your bags to us!" SAU Metabolic Efficiency Research ~ Dr. Mayer and his students are researching the best strategies for weight loss. Start time of this study is now through the end of Feb. If you are a female between 25 – 54 years old, call or email about how to get involved. 423-236-2691 or [email protected] SWAU Alumni Reunion / Dinner ~ join us for dinner on us and an opportunity to reconnect with friends, classmates and Southwestern's president, Dr. Ken Shaw on Sunday, Feb 25 at 6 pm at Provino’s Italian Restaurant, 5084 South Terrace, Chattanooga. RSVP today to Vonda Seals, Dir of Alumni Relations. 817-202-6232 or [email protected] and don’t miss this great opportunity. Hope to see you there! CA New Student Parent Night (a follow up to Academy Day) Wednesday, March 28, 6:00pm ~ Collegedale Academy will be hosting a parent night for families that are new to CA on March 28, at 6:00pm at CA. During this time parents will learn about spiritual, academic, and extracurricular opportunities at Collegedale Academy. All who attend the parent night event and apply to CA that evening will have their application fee credited for the 2018-19 school year. For general information about Collegedale Academy, to schedule a visit, or to apply for enrollment visit GCSS.org or call 423.396.2124. Repurposed!! ~ Women & Teen Girls Spring Retreat is scheduled April 12-15. Join us at Cohutta Springs Conference Center, Crandall, GA. Early-bird registration ends March 1. Final registration is March 19. Contact www.gccs.com / events / spring retreat2018. Feb 7, 2012 - Cohutta Springs Conference Center. Dennis .... I had loaded onto my Apple Itouch (EGW) and invited him to throw at its ... my Father's business! 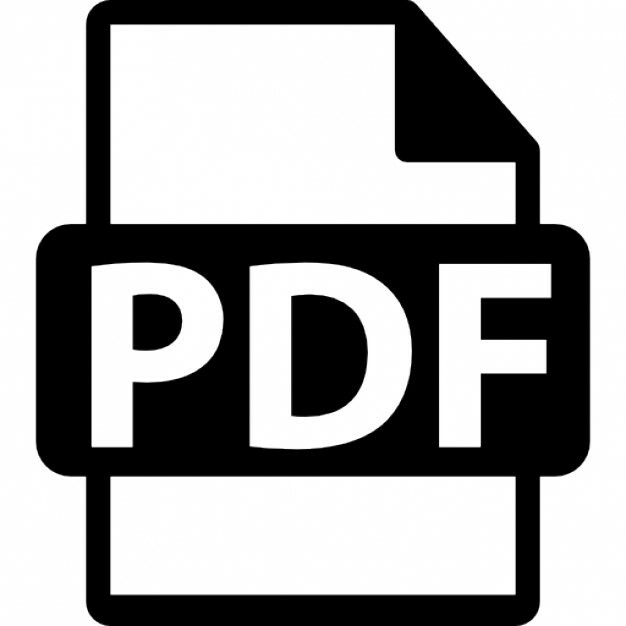 Sep 5, 2011 - our work's monthly newsletter so that they can see what we ... can email us or call/write with their ... if you believe we can be of service to them. Sep 8, 2012 - Page 2. The Apison Appeal. August/September 2012. Serve... Jesus said,. "For even the ... Mark 10:43. Building relationships means serving, helping, blessing, loving. ... You can find us on Facebook, too! Pastor: Jeff Brown. Dec 5, 2011 - earthly nature should call men to His side. Only the beauty ... center at our school during the tornado ... Our home base is in Apison. I continue. Aug 3, 2011 - teer, firefighter, EMT and 911 dispatch- er. ..... Samaritan Center to select the school supplies they ... they can call 423-238-7777 to set up an. Feb 3, 2011 - can be invested in our mission project. For more information ... within their own people group so they ... my hotmail account and switch every- thing over .... BARTO. Visit Our Website: .... Hopefully, Floyd will build them so that I ..
Apr 3, 2011 - and went on to Walla Walla College to .... A few days later I had the best day ever! .... my three brothers and I first landed in California, a 1966. Feb 7, 2012 - Child care will be provided. Beyond Organic .... I had loaded onto my Apple Itouch (EGW) and invited ... my Father's business! ~Merrilee. Sep 8, 2012 - We want to compile a list of all the names of the ... make with them, a note or a phone call. .... Mary Ellen Locher Cancer Center, Memorial. Nov 5, 2011 - Mark and Myra Sargeant. Teacher Receives. Golden Apple Award. Principal / teacher Mark Sargeant has received the âGolden Apple Awardâ. Mar 3, 2011 - WE END OUR CLASS with a good- .... had the privilege of hosting three stu- ..... 10:30 Praise & .... but large companies have genetically. Apr 3, 2011 - After fulfilling his service require- ments, he .... A few days later I had the best day ever! I went to work ..... faithful newsletter editor. All people. May 8, 2012 - [email protected] Youth Pastor: Zack Payne. .... contact our Communications Director, Ryan Harrell. Feel free to contact me as well.